Can be used anywhere on the model because it dries clear as glass. Plastic Model Kit. This is a Dragon Models 1:9 Scale Iron Man 3 Hot Rod Armor Marvel Plastic Model Kit. Display base included. End product of exhaustive CAD design, and the heroes are made with. If you're a Marvel Comics fan, reader, or simply know one, you can't go wrong adding the Mark 42 kit to your collection! Ages 14 and up. This is a Dragon 38336 1:9 Iron Man Hall of Armor. The Marvel Super Heroes model kit series from Dragon features blockbuster characters in 1/9 scale. Each stunning character is reproduced in model kit form allowing collectors and modelers to assemble their figures. The model figures are separated into as few parts as possible to ensure theyre extremely easy to assemble. Includes Interlock Hall of Armor Chamber Manufacturer: Dragon. Model Number: 38336. MSRP: 129.95. Category 1: Model Kits. Category 2: 1:12 (and smaller scales). Availability: Ships in 1 Business Day!. DRAGON MODELS 1/9 Marvel Iron Man 3 Iron Patriot Armor Model Kit 38114 - NEW! Ages 3 and up. Ages 14 and up for modellers. This is a Dragon 38328 1:9 Iron Man 3 Battle Damaged Kit. The Marvel Super Heroes model kit series from Dragon features blockbuster characters in 1/9 scale. Each stunning character is reproduced in model kit form allowing collectors and modelers to assemble their figures. The model figures are separated into as few parts as possible to ensure theyre extremely easy to assemble. Manufacturer: Dragon. Model Number: 38328. MSRP: 89.95. Category 1: Model Kits. Category 2: 1:12 (and smaller scales). Availability: Ships in 3 to 5 Business Days. This is a Dragon 38132 1:9 Iron Man 3 Mark XLII, Action Hero Vignette with Lighted Hall. Movable parts. 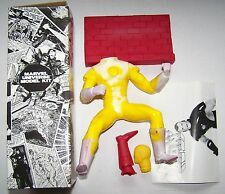 Can be assembled into multiple poses. Bonus interchangeable hands. Includes Hall of Armor base that lights up. Manufacturer: Dragon. Model Number: 38132. MSRP: 283.95. Category 1: Other Toys. Category 2: Model Kits. Availability: Ships in 1 Business Day!. This Iron Man 3 Mark 16 Black Stealth Suit Nightclub 1:24 Scale Model Kit features the Mark 16 Iron Man armor as seen toward the end of the blockbuster Iron Man 3 film. Ages 3 and up. Ages 14 and up for modellers. The Marvel Super Heroes model kit series from Dragon features blockbuster characters in 1/9 scale. Includes Interlock Hall of Armor Chamber. 200# Test boxes provide more strength and protection than a standard 32 ECT box – the light weight alternative. MOEBIUS "IRON MAN" MARK III 1/8 scale All plastic assembly kit. This is "IRON MAN" MARK III 1/8 scale All plastic assembly kit by MOEBIUS. Dragon 1/9 Iron Man Mark LVIII Avengers Age of Ultron . Condition is New. Shipped with USPS Priority Mail. This is Dragon 38155 1:9 Age Of Ultron Iron Man w/Tony Stark Head. Features includes life-like head sculpt, opened helmet, light up display base, detailed and accurate. New coloring technique, flying mode flaps. Highly collectible display model. Developed in 3D, using official data from Marvel, highly detailed and accurate. Dynamic poses with diorama base, fully colored and textured to movie likeness. Minimal assembly, plug and display. Manufacturer: Dragon. Model Number: 38155. MSRP: 221.95. Category 1: Other Toys. Category 2: Model Kits. Availability: Ships in 1 Business Day!. This is a Dragon 38145 1:9 Age Of Ultron - Iron Man - Mark 43 . Action Hero Vignette Special Features: - Multi-poses - Light up display base - Detailed and accurate - New coloring technique - Requires 2 AA batteries (not included) Manufacturer: Dragon. Model Number: 38145. MSRP: 195.95. Category 1: Other Toys. Category 2: Model Kits. Availability: Ships in 1 Business Day!. FROM STEEL SHEETS TO MUSEUM QUALITY 3D MODELS. 1/9 Iron Man 3 - Hall of Armor Mk 7 model kit. This scintillating new line from Dragon features movie blockbuster characters in 1/9 scale. Each of the world-famous characters in the series is the end product of exhaustive CAD design, and the heroes are made with an eye to perfect accuracy and authenticity. Lowe's Avengers Build & Grow Iron man. Wood building kit. Communication is the key in avoiding any issues. New in Open Box Iron Man Headknocker Bobblehead Doll. Limited Edition Mark II Armor. All plastic assembly model kit. This is a Dragon 38326 1:9 Iron Man 3 Starboost Armor Kit. The Marvel Super Heroes model kit series from Dragon features blockbuster characters in 1/9 scale. Each stunning character is reproduced in model kit form allowing collectors and modelers to assemble their figures. The model figures are separated into as few parts as possible to ensure theyre extremely easy to assemble. Manufacturer: Dragon. Model Number: 38326. Category 1: Model Kits. Category 2: 1:12 (and smaller scales). Availability: Ships in 1 Business Day!. This is a Dragon 38332 1:9 Iron Man 3 Hot Rod Armor Kit. The Marvel Super Heroes model kit series from Dragon features blockbuster characters in 1/9 scale. Each stunning character is reproduced in model kit form allowing collectors and modelers to assemble their figures. The model figures are separated into as few parts as possible to ensure theyre extremely easy to assemble. Manufacturer: Dragon. Model Number: 38332. Category 1: Model Kits. Category 2: 1:12 (and smaller scales). Availability: Ships in 1 Business Day!. 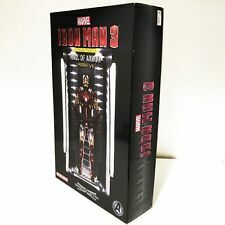 Iron Man 3 Mark XLII Battle Damaged Version Model Kit 1:9 Scale 38328 NIB! Each model is accurate down to the most minuscule details. We apologize for the inconvenience. If you’re looking for further detail, you might want to check the manufacturer or publisher website. This is Marvel Comics, THE ORIGINAL "IRON MAN". This is a fully painted & assembled cold-cast porcelain statue by BOWEN DESIGNS. This is in near mint condition, & never displayed. Only taken out of the box to take these pics. MARVEL AVENGERS IRON MAN PAPER CRAFT DIE CUT 12 INCH POSEABLE FIGURE~,NEW! Let your little super hero's artistic star shine! Tony Stark has battled more inner demons than villains over the years. Iron Man's Marvel Comics premiere in Tales of Suspense #39 (cover dated March 1963) was a collaboration among editor and story-plotter Stan Lee, scripter Larry Lieber, story-artist Don Heck, and cover-artist and character-designer Jack Kirby. Scarlett Johansson is Black Widow! Terrific 1:8 scale model kit based on the Iron Man 2 movie. Scaled to match the other Moebius Iron Man kits. Scarlett Johansson is the deadly Black Widow! In Iron Man 2, Scarlett Johansson makes the perfect spy as Black Widow, and this terrific 1:8 scale model kit makes the perfect gift for the Iron Man or Scarlett fan in your life. Plastic model kit. Color instructions.